I am currently seeking postgraduate students to work in this area! See my Research Students page for more details. K. Kitto, S. Cross, Z. Waters & M. Lupton. Learning Analytics beyond the LMS: the Connected Learning Analytics Toolkit. 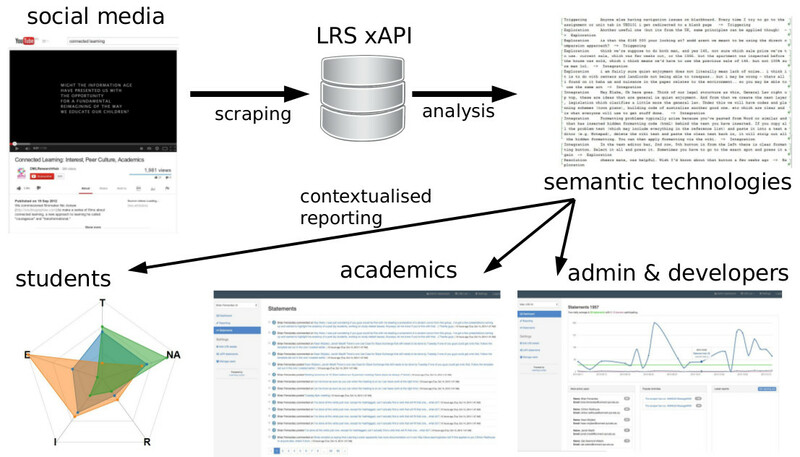 Learning Analytics and Knowledge (LAK'15), In Press, ACM. This project has now been funded by the Australian Government's Office for Learning and Teaching (OLT). The Proposal that we submitted can be found here if you would like more details. Feel free to contact me about it! One example scenario of using the CLA toolkit could revolve around specific activities using YouTube. Get each of your students to upload a YouTube video that they had created. Then send you the YouTube identifier (i.e. URL) and their username. We have a tool that allows you to access YouTube data, and enter it into an xAPI LRS. If you enter a specific YouTube URL, then the tool will extract all of the textual data from that webpage and send it to a LRS (as long as the people who posted comments have an account on the system, and have registered their YouTube username with the system). We will be making this tool available via GitHub when we launch a prototype of the CLA toolkit (hopefully before the end of 2014 so keep an eye out). For now, you can check out a simple demo by following this link .